Dynamic Notes 3.27 is clocks & alarms software developed by Power Soft. The program Dynamic Notes is a multi-featured scheduler, reminder, and organizer for Windows allowing you to create electronic stickers and display them when the time is due. The program is very easy to use and has low system requirements. The scheduler stays in the tray and does not interfere with your activities. If necessary, it can be displayed as a small toolbar on the desktop. All the parameters you may need to change are customizable. This program is shareware, which means you can download and use Dynamic Notes 3.27 for free during 30-days trial period. 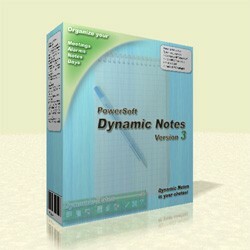 After this period you gonna have to buy Dynamic Notes 3.27 software for $14.95 or uninstall the program. Dynamic Notes 3.27 supports different languages (including English, German, Russian, French, Italian, Spanish). It works with Windows 98/XP/Vista. We have tested Dynamic Notes 3.27 for spyware and adware modules. The software is absolutely safe to install. Our website has thoroughly tested desktop product Dynamic Notes 3.27, written the review and uploaded installation file (1554K) to our fast server. Downloading Dynamic Notes 3.27 will take minute if you use fast ADSL connection. Powerful reminder and task scheduling program.